It’s the second time the race has been on the clubs champs list, but I have done High Cup Nik race 3 times before. I missed Blake’s Heaven due to Flu, so this would be the first race of the year for me. 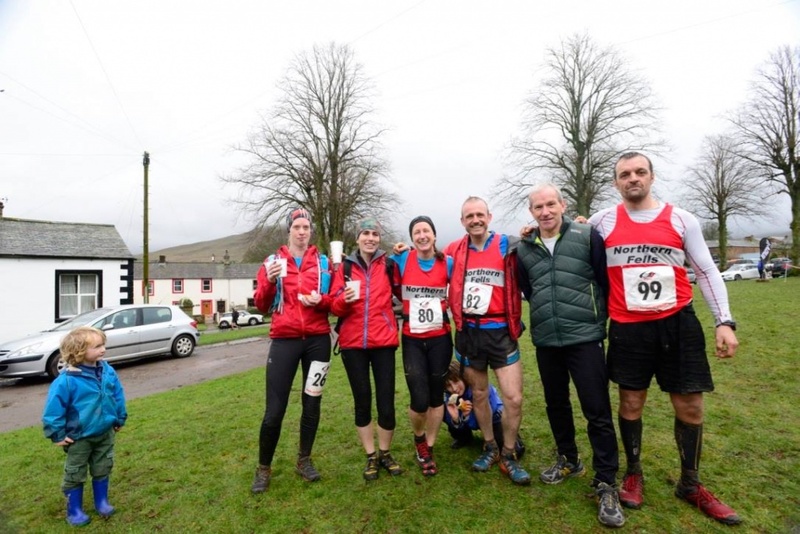 Once you have done it once you don’t really need to recce it again, but I recced it twice recently – once to show Liz Berry the route, as she was keen do the race this year, and another time to take a group of 6 from the club. It’s always a pleasure to run up the Nik, it never disappoints even in poor visibility. Every time you come round and over into the valley its always a bit overwhelming how huge it is. The weather forecast wasn’t looking great for race day, but when I woke up on Saturday morning it was worse than the forecast with horizontal rain and gale force winds. I did briefly wonder if the race would be cancelled or re-routed but that was only a fleeting thought – it’s a fell race after all! Then a text arrived from Liz Berry – her husband Jon had been blown over running early in the morning and fractured his elbow – she wouldn’t be coming to the race! That doesn’t bode well for High Cup Nik! Then a phone call from Phil Pearson– water logged roads around his house and concerns re. car, he would be giving it a miss this year. Whether to go or not? Nah – don’t wimp out Nat’s, go and enjoy the experience, at least the pressure to beat my previous years time will be off as the conditions will be so bad. Keep in mind those lovely cakes in the hall after you finish! So in the end there were 6 of us from the club, which was pretty good show considering the weather. Particularly impressed to see Trevor Symonds there who had driven from Yorkshire that morning. Interestingly the weather in Dufton wasn’t that bad, it had stopped raining and the wind had abated…oh dear, pressure on again to beat my own time. Then before you know it you are off, the road run up to the fell is hell, I go off fast aiming to keep with the front ladies and then loads pass me on that first steep road bit. I must try harder to keep going and don’t get demoralised. Nina Walkingshaw is already 5 mins ahead, even though I try and stay with her near the start. I feel wheezy, maybe my chest hasn’t recovered from flu. Maybe I have asthma? Think I was just working hard. Once we hit the fell it was obvious how tough it was going to be – bog, mud, no firm footings, feels more like a cross country race the first bit of fell. Once you get round into the Nik valley you can relax a bit, and steady away. The river was deep this year, so it was more awkward getting across. My feet froze after the river crossing – should have worn my sealskins for warmth but didn’t due to vanity – that will teach me! Running on frozen feet stubs on boggy flat tufty ground up to the Nik was interesting, but kept my pace steady. Bizarrely I like this section on the race. My strategy was to push on the steep Nik and gain a few places when everyone else was walking in a line. I had shared this strategy with Rose Singleton on our recce, and she played me at my own game, bounding past me like a gazelle, so light and nibble on her feet she seemed. One man behind me commented on her stealth move as ‘impressive’. Once she was in front of me I tried to keep up, but was suffering from the psychological hit of being overtaken, so I just kept pace and let her go. Each year once I get on the top my legs feel like they don’t want to go, and this year it was worse than ever. I knew I was slow on that bit, I felt like a runner in a movie where someone had pushed the slow-mo button. Once I got over the first incline I was getting my strength back, and I pushed hard overtaking several runners including some ladies, so the psychological edge had kicked back in and I was gunning for the finish again. Crossed the line in 1hr 28 something or other, 3 mins slower than my fastest time, and 2nd FV40.